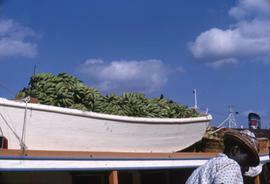 Colour Kodachrome 35mm slide depicts a boat filled with bananas. There is a man in the foreground. 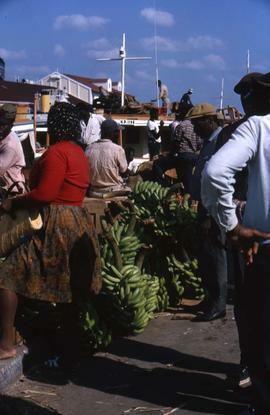 Colour Kodachrome 35mm slide depicts a crowd of people with bananas in the centre and a boat in the background. Colour Kodachrome 35mm slide depicts a man and a woman looking at a large amount of bananas. In the background there are people walking and sailboats. Colour Kodachrome 35mm slide depicts a man cutting up what appears to be a type of shellfish. Colour Kodachrome 35mm slide depicts a man with his hands in a box of what appears to be squid. Colour Kodachrome 35mm slide depicts people walking down a street with baskets for sale in the background. Colour Kodachrome 35mm slide depicts a pile of headless lobsters between two cardboard boxes. Colour Kodachrome 35mm slide depicts a woman sitting on a wooden crate on a dock with vegetables organized on a blanket in front of her. The woman is looking back at a man and a boat, which are behind her.